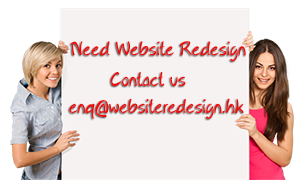 The whole point of redesigning a website is to improve the content and layout. Putting together a website is easier than ever, but as the site grows, the time for website redesign will eventually come. For the redesign to be a success though, it must provide information your visitors are looking for. According to research, websites have 3 seconds to make an impression on a visitor before they move on. First of all, remove any unnecessary elements on the page that slow down the loading time. Second, your homepage needs to be visually appealing and make the content as clear as possible. Meaning, a visitor should know at a glance just what your homepage is about. If your website isn’t doing what it’s supposed to do, you need to improve the call to action. Whether it is to buy something, subscribe, contact you, share the site etc., it’s crucial the most important content is high on the page so users don’t have to scroll down. In addition, organize the content so the focus is not on you, but what your product / service / brand can do for them. Second, the information you provide needs to be short and direct to the point with absolutely no fluff. If you need to describe the product in length, divide the content into small chunks so it’s easier to digest. One page sites are very popular now as people don’t like the idea of clicking one page after another. But they won’t be happy either if your site requires endless scrolling, so the best compromise is to put just enough relevant content on the page. If necessary, add more, and if you’re worried about your website getting too big add a search function. People don’t always read text on websites and actually prefer to just skim the content, which is where images come into play. Images hold people’s attention way better than text, so if you want to drive home a point, see if it’s possible to use an image to do it. Of course it will depend on the kind of image you use so ensure that it’s high quality and tells the story accurately. Not everyone goes here, but it’s an essential aspect of your page and must provide information. There’s no need to put too much info as readers will probably just skim through it though. Simply focus on the highlights and use bullets and bold text for emphasis. But more than the history, the page should deliver the message you know what customers need and how they’ll benefit from establishing a connection with your products / services.